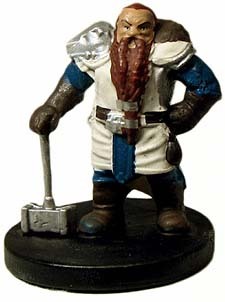 Ulfgar Ironfist is a shield dwarf who's served the Order of the Gauntlet faithfully for decades. Tough, focused, and ready to strike a furious blow with his hammer at a moment's notice, Ulfgar has performed noble deeds and righted numerous wrongs in service of the Order. But no dwarf fighter is at his best without an array of impressive gear. Ulfgar's arrow catching shield has saved him from thousands of arrows over the years, and his ring of the ram sends powerful bursts of force into the sky to compel mighty dragons to fight him on the ground where they belong! The Order of the Gauntlet has now asked Ulfgar to explore Rivergard Keep, an old castle that they have learned is secretly a fortress for the Cult of the Crushing wave, an elemental cult serving Olhydra, the Princess of Evil Water. But when Olfgar and his allies arrive at the riverside fort, they are faced with formidable defences, including endless hails of frost arrows. Ulfgar grins and prepares to charge. It looks like his arrow-catching shield will be put to the test once more!